Product review: Microlite Flight Experience – by anon, 26 Sep 18 4/5 Good "A little troublesome to organise due to organisers being on holiday and telephone answer service blocked. However, once this was resolved it was easy. Quick and easy (to get there) although the road around airfield was badly pitted and could do with some urgent treatment to fill in ruts and potholes. (Staff) Excellent. They could not have been more helpful, both David and Dennis were good ambassadors. The aircraft was brilliant and in very good condition but found seating a little bit cramped. (Briefing) Very good. Perhaps thought should be given to explain that once helmet was 'on' fitted nose wiping was not a option. As Dennis said 'SNOT was acceptable. The snood should be given as a keepsake. (Experience) Excellent but far too short ( 30 minutes)could have had hands on a little more. I would do it again and will certainly recommend the experience. Photographs were taken but not in flight. We lingered in the airfield restaurant for a meal afterwards. Photo's enclosed. After initail contact problems with operator Stephen Rodgers (Experiences4all) was able to sort things out personnally. " Experiences4all says: Some of our operators are single person and machine so may be a bit difficult to contact sometimes but we can always find a way. After a warm welcome from your instructor and a short briefing you'll be airborne on a wild ride through the skies above the beautiful Devon countryside or down to the magnificent south coast, soaring with the birds. Subject to local restrictions the choice is yours. You will be flying in a modern Flexwing Microlight. Flexwing microlights are derived from the hang glider and although flexwing technology has progressed far and very quickly, it still has that increasingly rare pioneering feel about it. 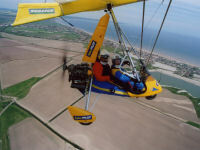 The aircraft consists of a moveable wing that pivots on the 'trike' unit so that wherever the weight of the trike is put, the aircraft will roll or pitch in that direction. These inputs are made via a single horizontal bar in front of the pilot . The flexwing has a more 'open to the elements' feel than a fixed wing and is much simpler in construction. During your trial flight, you'll be given the opportunity to take the controls and fly the aircraft yourself (under the watchful eye of your CAA qualified instructor) but it's by no means obligatory. You'll also be allowed to take a camera with you to capture your flight. Or, if you prefer, we can capture the whole flight including sound on DVD and send this to you in the post within one week of your flight. This is available as an option on the day, please advise your pilot if you would like to take advantage of this facility. Flying suits will be provided. A little troublesome to organise due to organisers being on holiday and telephone answer service blocked. However, once this was resolved it was easy. Quick and easy (to get there) although the road around airfield was badly pitted and could do with some urgent treatment to fill in ruts and potholes. (Staff) Excellent. They could not have been more helpful, both David and Dennis were good ambassadors. The aircraft was brilliant and in very good condition but found seating a little bit cramped. (Briefing) Very good. Perhaps thought should be given to explain that once helmet was 'on' fitted nose wiping was not a option. As Dennis said 'SNOT was acceptable. The snood should be given as a keepsake. After initail contact problems with operator Stephen Rodgers (Experiences4all) was able to sort things out personnally.